Today I was to setup a B2B configuration. So I wanted to have two SOASuite11g VM's working together on my laptop. My colleague created a VM for this particular client in VMWare Player, so I wanted to use that one, in stead of one of my VirtualBox VM's. One of the features I rely on in this setup is the host-only network. Since it is a B2B setup, I need the two VM's to communicate together, so they have to be able to ping each other over the same network. 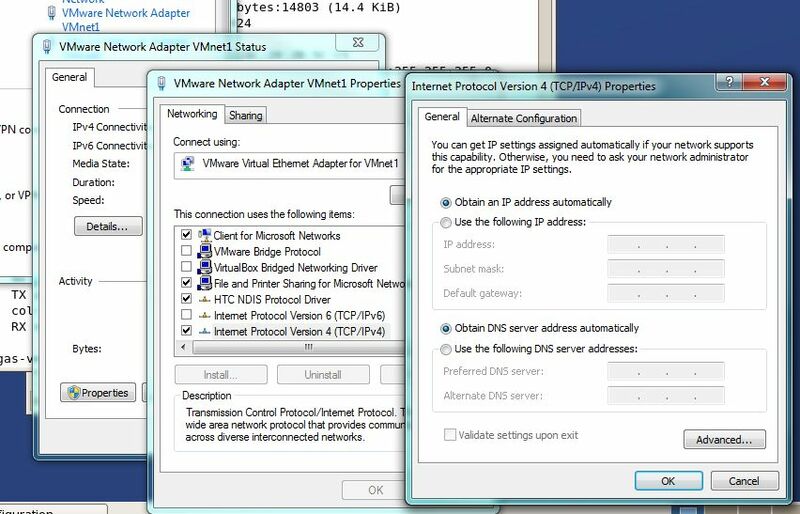 Although internally in the VM the particular network adapter will get an ip-address. But it was not "pingable" from the host. I was about to uninstall VMWare Player and re-install it to get it defaulted again. But probably it would not make a difference in this. Luckily I found this terrific post that helped me out. Thanks Tino. And it gives some tips about how to do some VMnet changes on the commandline that cannot be done UI-wise in VMware Player. 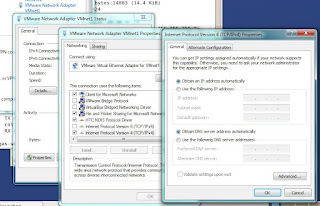 It turns out that in Windows 7 the VMNet1 adapter on the host was set on manual setings having a an auto-ip address (eg. 169.254.x.x). Disable "Internet Protocol Version 6 (TCP/IPv6)". Select "Internet Protocol Version 4 (TCP/IPv4)" and click on the button "Properties"
Set the radio button on "Obtain an IP address automatically"
Then it solved my problem. I had exactly the same problem with VMware Player 7.1.0 with a Windows 7 host. Your tip fixed it right up. Thanks! Again, this solution worked for a VMware Player 7 with a Windows 7 host. Again, this solution work with a VMware Player 7 on a Windows 7 host. Thank you!